A Happy Song: Stuck Indoors. Completing Some Pins. Stuck Indoors. Completing Some Pins. 1. Soft Caramel Corn from The Girl Who Ate Everything. This recipe claims that it is the softest most wonderful carmel corn you will ever have (or something along those lines). We had a movie afternoon last week, so I decided that we'd have this for a little treat. I used a single bag of popcorn and halved the other ingredients. This truly is the best carmel corn I've ever had. The kids loved what little I gave them (I ate all of the rest). It came together really easily and delivered. This recipe is a keeper. 2. Buttermilk Roast Chicken from Smitten Kitchen. D doesn't love roasted chicken, but sometimes it just sounds like something that I have to make. You can hardly go wrong with a recipe from Smitten Kitchen. This recipe requires that you marinate/brine your chicken for a good 24 hours. The end result was probably the moistest chicken I've ever had. A couple of notes: I used smoked paprika (which I'm now in love with) and it ended up taking my chicken a lot longer to get up to temperature. I used all legs, but they were gigantic legs. I think they were in the oven for a good 45 mins. I started checking them after the recommended 30 minutes and they definitely needed more time. Also, the skin never did get very crispy, I ended up removing the skin on my serving (after roasting) and enjoyed it a lot better that way. Again, this recipe would be a keeper if D appreciated bone in chicken more. 3. Cheesy Biscuits from Plain Chicken. I was really excited about this recipe and felt rather like Martha Stewart baking these on the same night as the roasted chicken. I was really hoping that they would taste more like the biscuits at Red Lobster. No joy. In my opinion, these need more cheese and less sugar. The end result was just too sweet for me. That said, the kids liked them more than I did. For my taste, this recipe needs tweaking. 4. 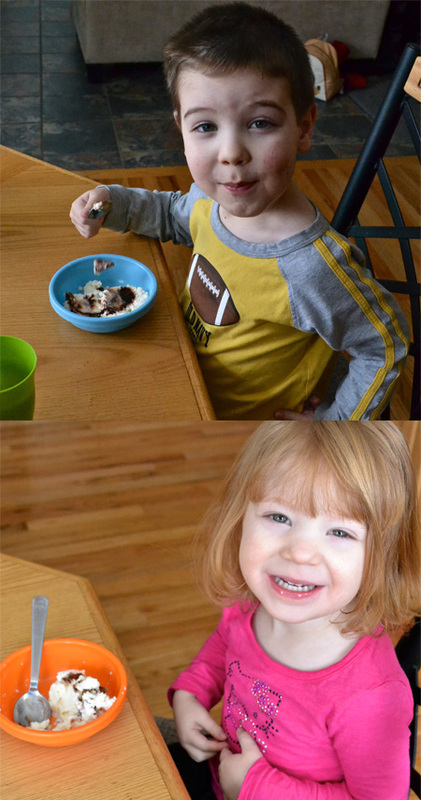 Snow Ice Cream from Life with Moore Babies. I'm amazed that with all of the snowy winters I've been through, I'd never heard of snow ice cream. I heard mention of it from one of my Face Book friends and promptly pinned this recipe. 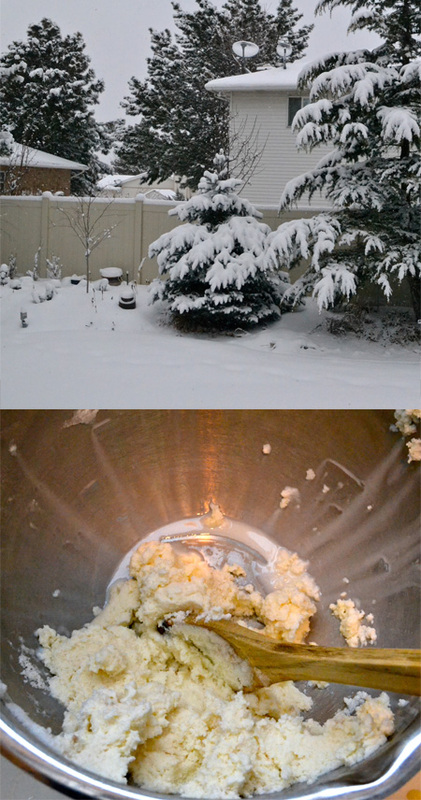 We certainly had enough snow for it, so I had Jellybean help me collect some and we mixed up a batch. It was delicious. We added a little extra snow to cut the sweetness. I think we'll have to make a tradition out of making this on snowy days.